This is a special treat for my friend and I while our husbands were playing poker next door. I figured we both deserved something extra special. 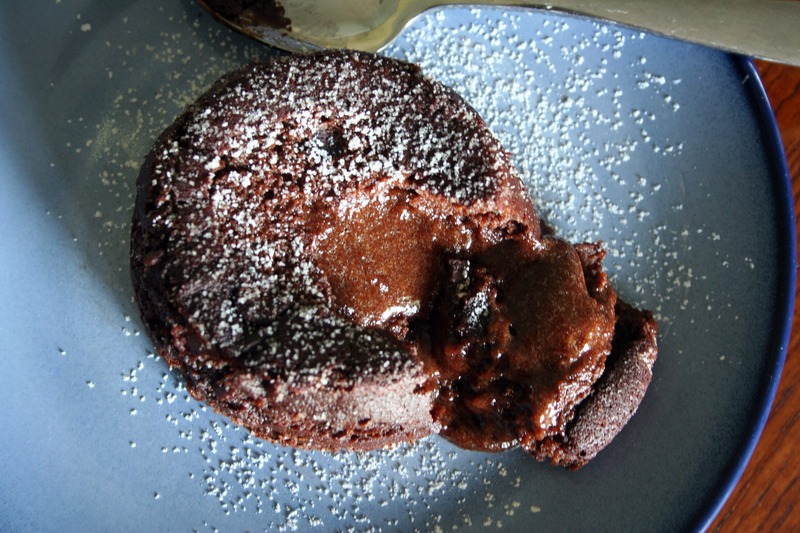 I have made a lava cake before, but I wanted to try a new one that was perfect for two. I didn’t want to make any more than that cause we’d have to eat them all! 😉 Kidding – I love dessert, but treats like these are better in small amounts because they are so rich. Here’s hoping that these turn out as good as they look on the picture! Oh, and this recipe is scaled down for two, but the original recipe is for four. What’s great about that is you can make the full amount and cover the other two with plastic wrap and put them in the fridge. Use them within five days and let them sit out at room temp for 20 to 30 minutes, bake as directed and enjoy. Verdict: These are amazing! Not too sweet and not too rich – perfect amount of chocolatey goodness. Make sure that you take these out when it still looks under cooked. You want it to look really soft in the center (the magic moment was at 8 minutes for me), just watch it carefully after 7 minutes. Let it cool for about 5 minutes before inverting onto a plate, sprinkle with powdered sugar and serve with vanilla ice cream or whipped cream. I prefer the ice cream 🙂 Thanks for reading, enjoy! Preheat oven to 450 degrees. 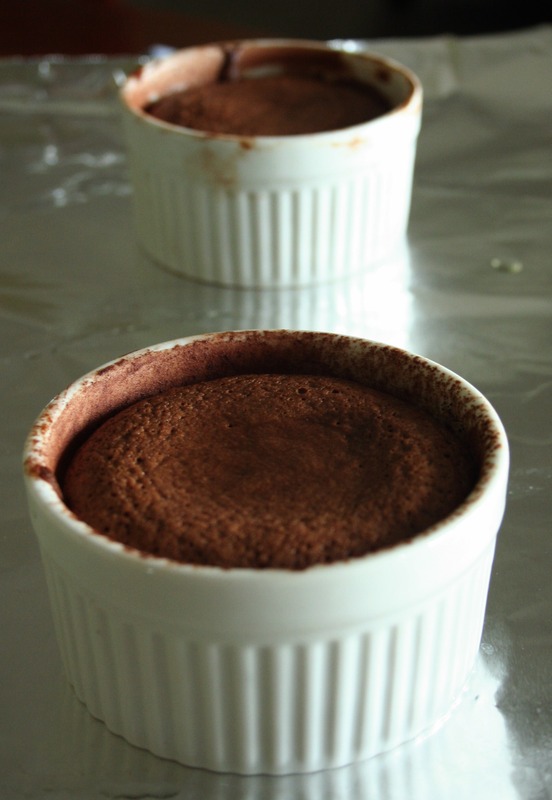 Butter the 2 – 4 ounce ramekins and lightly dust the inside of each with cocoa powder, tapping out excess. Heat butter and chocolate in heat proof bowl set over (but not touching) simmering water until chocolate is almost completely melted. Meanwhile, in the bowl of an electric mixer, whisk egg, egg yolk, and sugar until light and thick. Slowly add butter mixture to mixer, add flour and mix until combined. Divide batter between ramekins. Place on a baking sheet and transfer to oven. Cook for 7 – 10 minutes – sides should be set and center soft.